I’ve given you 2011’s best albums. 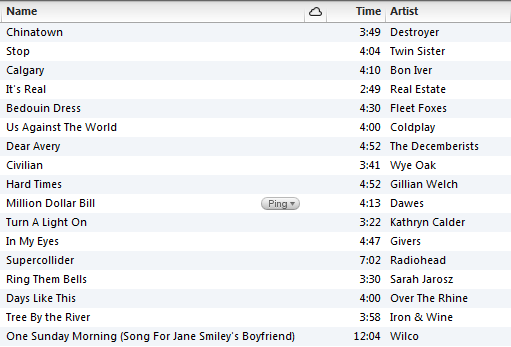 Now, behold, the year’s top tracks in 80 minutes or less, as selected by a distinguished panel of me. NB: For about half these artists, I would’ve chosen more than one track (esp. Fleet Foxes, Twin Sister, Dawes, Real Estate). So there are some pretty great tracks that didn’t make the cut. "Calgary" by Bon Iver: I’ve never been an admirer of Vernon’s vox, but "Calgary" comes off like the omega to Another Green World‘s alpha. It is quite possibly the most unusual song I heard last year, and also, quite possibly, the very best. Amazing video too. "It’s Real" by Real Estate: Although I missed the wonderful nostalgic haze of Real Estate’s debut on 2011’s Days, the band’s second LP featured some flip-floppingly breezy garage-pop goodness. "It’s Real" is perhaps the best cut, a sing-along inducing nugget that makes the case for Real Estate being one of the best bands on the block. "Us Against the World" by Coldplay: Chris Martin has to be one of the most under-appreciated songwriters in the world today. True, I’m sure the guy gets "appreciated" mighty well in the pounds-sterling department, but the point is the dude can write a freakin’ song. It’s that point where Martin’s voice ascends into the lyric mimetically that slays me: "If we could float away/Fly up to the surface and just start again/Lift off before trouble just erodes us in the rain…"
"In My Eyes" by Givers: One of the band’s more "downbeat" tracks, "In My Eyes" is nevertheless still pretty bouncy and catchy and all that. But there’s more texture here, a narrative arc more dynamic than some of the band’s more prominent tunes. The breakdown at the end is one of the band’s best moments, showcasing all of their strengths. Love those voices, love that tropical post-punk sound. "Supercollider" by Radiohead: 2011 was the full realization of Radiohead’s independent dream. They released not only their shortest album to date, but a couple of outstanding non-LP singles as well. "Supercollider" is the best of the lot, a tense builder that recalls the bleak tunefulness of In Rainbows, the icy synthscapes of Amnesiac, and the utter brilliance of Thom Yorke’s voice. "Tree By The River" by Iron & Wine: An optimistic and warm address to Mary Ann. "All the thorns and the roses/Beneath your window panes…" A lovely peace of nostalgia.